Are you a Malaysian travel blogger? Or a travel blogger based in Malaysia? 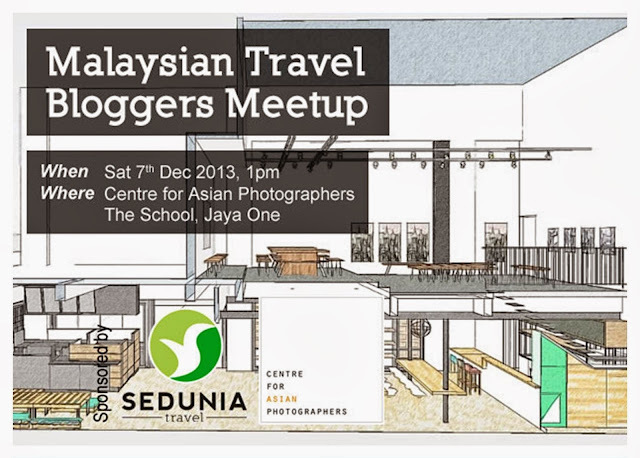 If you are, come and join us at our second meetup on Saturday afternoon, 7th Dec 2013. There'd be a talk by, and a Q&A session with, Curator/ Director of the Centre for Asian Photographers on travel photography. There'd also be another topic which would be advised soon. This is going to be a very casual afternoon where we can mingle and network with fellow travel bloggers, share stories and headaches while talking about travel, photography, blog promotion, tips and tricks. For some ideas on how our first Malaysian Travel Bloggers Meetup was like, check out the following write up by Efendi, Emila, Fienuts and last but not least, Jard, the founder of Malaysian Travel Bloggers group. So interested in joining us or to find out more? Do register yourself first here (link removed). Space is limited so be quick! Thanks for this info ..
Like to join this meetup.. :D tapi terasa diri masih kecil.. huhuhuuu..
Eh! Join je lah. We're going there to learn from the experts and from each other too. I'm sure it's going to be beneficial to everyone attending.